TNG is excited to share our Quick Quote Tool. 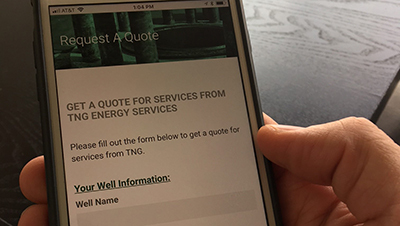 Customers can now visit our website and click the REQUEST A QUOTE button or enter the address www.tngenergyservices.com/request-a-quote/ into any web browser and be able to enter their well information to generate a specific email with the details we need to reply with a quote. Once you visit the link or webpage once, you can save this as a shortcut (app) on your phone with the simple instructions for iPhone/Android users below. The next time you find a leaking or corroded valve or wellhead – you can literally open the App from your phone, standing right next to the well in question, enter the data and we’ll be notified to reply back with a quote right then and there! Did you know you can save this page as an app on your phone? • iOS/iPhone: Using the Safari browser, click on the share icon. Then click “Add to Home Screen” which will add a shortcut icon to your device that, when clicked, will take you directly to this page. • Android: Using the Chrome browser click the triple-dot icon in the upper right, then choose “Add to Home Screen” from the displayed menu.